In 1945 the California Fruit Exchange (est. 1901) built a fruit packing shed located at Taylor and King Roads in Loomis. It was one of many in the region processing fruit. By the end of the 1950’s orchards occupied every usable acre of land at this end of Placer County. Peaches, plums and pears were brought in all summer from local farmers. The fruit was sorted, packed and shipped nationwide over the next three decades. The last use of the Blue Goose was by the Loomis Fruit Growers Association. Fruit was picked, sorted and packed on each ranch and then delivered to the Association dock to be cooled and compiled into rail car shipments. The Association closed the doors in 2001. By then it was one of only three fruit sheds remaining in the Loomis Basin. They had already given the keys to the non- profit South Placer Heritage Foundation (SPHF) and put the care of the historic building into their hands. During the summer of 2002, SPHF began making exterior changes to improve accessibility, rebuild the dock area and upgrade rain gutters and drain pipes to the empty building. In 2003, a fire sprinkler system was installed throughout the 26,000 sq. ft. icon. 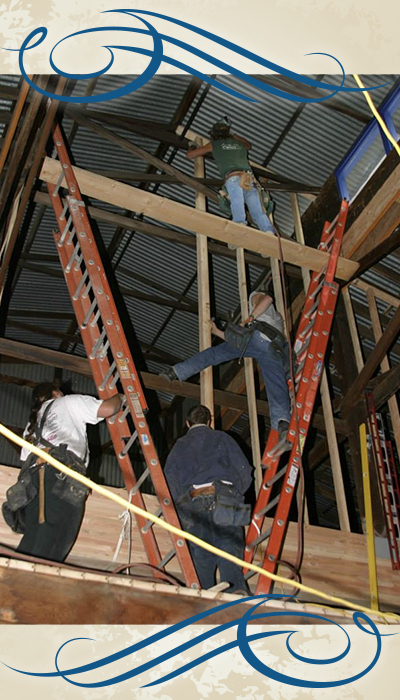 Inspired by the desire to preserve the barn-sized building for future generations, the summer of 2004 saw a flurry of activity as a small army of volunteer electricians, painters, sheet rock installers, plumbers, general contractors and electricians made major changes to 10,000 sq. ft. of the north end of the building. The volunteers, by coming together and sharing thousands of hours of labor, inspired an even deeper sense of community. Over 100 businesses and community members donated in kind materials, labor and volunteer efforts valued at over $350,000 to complete this phase. The result was the Blue Goose Event Center. Once the doors open, the Event Center quickly became the center of community activities. But the renovation continued over the next years to add amenities and comfort while retaining the distinctive architectural and historic look of the building. That has helped retain a sense of its past while creating a venue for all kinds of activities for the region. Over $1,000,000 has been invested in the Blue Goose, but the project is not completed. It’s onto other improvements to keep this regional icon a vibrant and valuable asset. The South Placer Heritage Foundation Board’s plans for Phase 4 in the coming years is to design the second floor of the events center, landscape, upgrade the parking, and add more lighting.